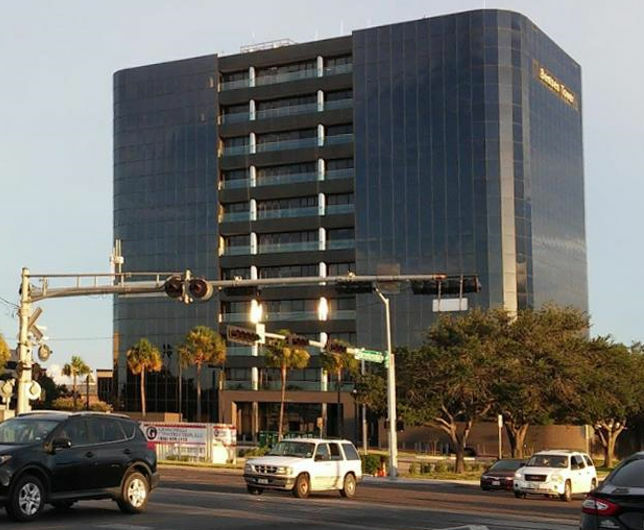 The Bentsen Tower is seen in an undated photo from the GSA feasibility study on a McAllen federal courthouse. McALLEN — Times were tough for federal employees recently, but they were about to get tougher for some, if lawmakers hadn’t finally reached a deal to reopen the government Friday after a more than month-long impasse, the longest shutdown in U.S. history. Federal employees who spoke with The Monitor leading up to Friday’s news — in which congressional leaders and the president finally agreed to a tentative deal opening the government for at least three weeks, with border wall funding expected to be negotiated during that time — anticipated a deal being reached. Such optimism belied concern over making ends meet should the shutdown have extended for months. The night before a deal was reached, the same employee who had not been paid since December used a significant amount of his savings to pay his February obligations, including his mortgage, utilities, his car note and other bills. The longtime federal employee worked in the U.S. federal court system, specifically in the McAllen federal courthouse, which is one of the six divisions making up the Southern District of Texas. President Trump said government workers can expect back pay “quickly or as soon as possible,” but it remained unclear when. The federal employee in question is one of about 800,000 such workers nationwide who felt the pressure of mounting bills leading up to the shutdown’s end, potentially missing another check as of this Saturday. Despite his best efforts to prepare and “weather the storm,” uncertainty about how long he could go without asking for a loan added to his worries. So he began to save for such an occasion, just in case. “… I can handle another month, maybe two, before I have to really get desperate,” he said Thursday. To avoid likely reprisals from their bosses for speaking to the media, he and another federal worker, who is also employed at the McAllen courthouse, each spoke to The Monitor on the condition of anonymity about the effects of the 35-day shutdown. Since the shutdown began assistant U.S. attorneys across the country — including members of their staff, such as legal aides — did not receive any pay while working caseloads and representing the government. But federal public defenders, who provide legal services to those who cannot afford representation, and U.S. federal judges have been receiving checks using funds allocated by the judiciary. This was only temporary since those funds were scheduled to run out by their next payday on Feb. 8, when they were expected to receive their last check, which would have only been for half what they were owed. This employee, who has decades of experience in the federal court system, said he was grateful to receive one last full check this weekend but was worried for his counterparts, the assistant U.S. attorneys, who were headed for a dire situation. Asked if he spoke with the government prosecutors about their situation, he said it was a delicate topic. He said he and some of his coworkers recently pitched in to buy their counterparts donuts — a small gesture of support. In anticipation of defaulting on his own mortgage, he said he called his banks to ask if anything could be worked out, only to be told the bank would notify him after 30 days of defaulting. “The government has a letter that you can download and give to creditors. Those creditors don’t give a s—. That’s the reality,” he said. The other federal employee echoed his colleague’s sentiment: There’s very little help for them during a government shutdown. He added that since the shutdown, he had not made any expenses unrelated to food, and definitely nothing that could be considered a luxury. This included purchases for his child, and colleagues also had to cut back on dining out and taking lunch breaks. You could see the stress on people’s faces, he said, noticing an uptick in absences in recent weeks. Despite the stressful environment that accompanies financial uncertainty, he said they did their best to have a sense of humor in the office. He was also concerned about the effects of a prolonged shutdown affecting current investigations, such as grand jury subpoenas and the logistics of paying travel expenses for witnesses in trials. The employee said cases may have also been impacted as a result. Earlier in the week, in another example of how criminal investigations were being impacted by the shutdown, the FBI Agents Association released a 72-page report with on-the-record testimonials from agents themselves. They detailed how the shutdown impeded their work, with pleas to reopen the government so they could pay confidential informants and afford current operations. U.S. Rep. Vicente Gonzalez, D-McAllen, who was part of bipartisan lawmakers who met with the president to work on a deal to reopen the government, said he spoke recently with a federal prosecutor who told him people were feeling the stress of the shutdown. “Morale is down, I can tell you that — that alone impacts safety; how law enforcement and prosecutors feel on a daily basis; when you know you’re not getting paid for the work that you do,” Gonzalez said. He reiterated on Thursday that the country was at risk while under shutdown. In light of the underlying issues, financially, and personally, a sense of duty is a sort of guiding light for these career public servants, each making it clear, that they still have a job to do, a job driven by passion to serve. His colleague said he and his coworkers are a dedicated bunch, having endured shutdowns in the past. But he added that this type of stress could have lingering effects and a long-term impact on federal courts. “You don’t want me and the other guys that are up here that are experienced, to say, ‘You know what, I’m done with it. I’m tired of being overworked, underpaid, and then now not paid at all.’ If enough of us are fed up you’re going to increase the quality of the defense bar, and defense representation, and you’re going to decrease the quality of the government’s office, the AUSA’s office. So yeah, there’s going to be a downstream effect of less talent,” he said. Even with news of the deal, the president made it clear, if he doesn’t get a deal for border wall funding, the potential for another shutdown remains on the table, and potential for utilizing emergency powers to that end.